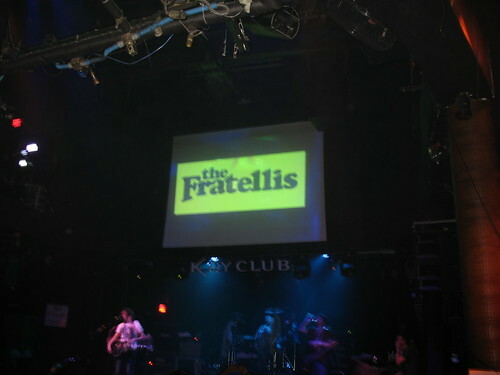 We saw The Fratellis last night at the Key Club. So fantastic! As an old fogey, these days I don't attend many general admission concerts. I really enjoy sitting (or at least having an option to sit). It's not often I go to tiny clubs anymore, but I do what I need to do to see great little bands like The Fratellis. It's hard to get clear pictures when you're jostling about. 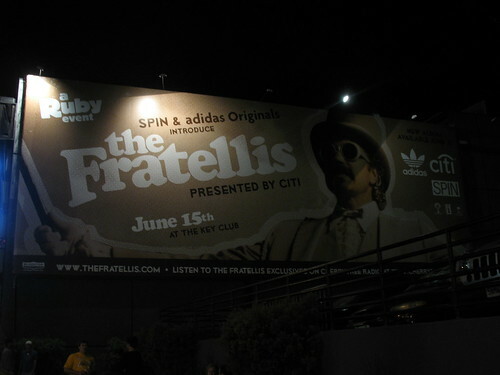 I don't think The Fratellis will stay that little for long. If you've never heard of them, I highly recommend getting their debut album Costello Music, which I have played on repeat countless times. Their recent sophomore effort, Here We Stand, released just last week isn't bad either, but Costello Music is hands down one of my faves from 2006. It always puts me in a good mood. In fact, "Flathead" is one of the Monkeys' favorite songs -- we like to sing it together in the car! Baby Fratelli (the end of it and the end of the concert). Oddly, I didn't feel old at the concert. I actually felt rejuvenated. I must admit I was sort of miserable for the first 15 minutes, but then I got over personal space issues and remembered how to hold my own at a small club concert like I did years and years and years ago. And then I was in heaven. i may need lessons. i have forgotten how to enjoy general admission. already. 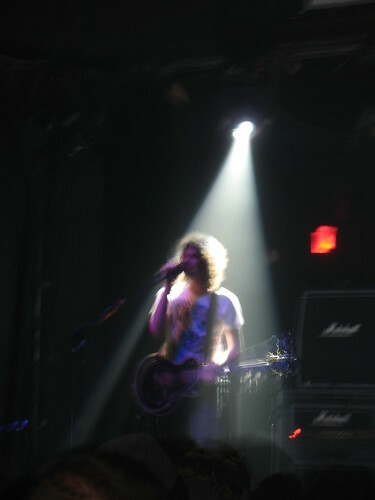 Seeing your pictures and video makes me feel odd and old as I've never done the band in a club thing. Your Disney-loving, pop-music-listening, SATC-watching friend. Oooh, I'll check them out! bf loves the fratellis! i kinda love them too..but only by default. i also am a reserved seat snob...I HATE general admission. yay to being transported to heaven! Just realized fashion is to diabolina as music is to weemo. Fashion not so much for weemo, music not so much for diabolina. interesting. I love them!!! I'm jealous. I grew up on club venues so I'm used to shoving. Especially the girls who wear their hair down and jump a lot! You are ever so much cooler than your average old lady. I had to google who the heck they were.